Roman Bucyk loves three things: baseball, his girlfriend Hannah and his country. Roman also knows that because of an ankle injury, he is never going to make to the big leagues, and he has even been slowly working his way down the batting lineup of the Cenreville Red Sox, his team in the Eastern Shore Baseball League. Roman may love baseball, but he knows his major league career aspirations are over. Since it also looks like the United States is preparing to enter the war soon, Roman, along with some other members of the League, has enlisted in the army. Now, it's the very last game of the Sox season, tomorrow the league will no longer exist and Roman will be off to boot camp. What to do? He decides to ask Hannah to marry him, and she says yes. During basic training, Roman is trained in tank warfare, and he turns out to have a real talent for driving one. Most of the time is spent on training and more training in the Carolinas and Louisiana, but Roman is chomping at the bit to get into real warfare. And when the US finally does enter the war, he is sent to do more training in Ireland. After months and months of training under all kinds of conditions, Roman finally gets to fight Nazis in North Africa. But war doesn't turn out to be what Roman thought it would be. There is nothing romantic about living and sleeping sitting up in a cold tank day and night. In fact, it is pretty scary the first time they come under attack, and each time after that. From Algeria to Tunisia to Italy, amid all the loss and destruction, the introspective Roman realizes that the most important thing about the war is getting home to Hannah alive. But the war has really just begun, and Roman has more fighting to do before going home can happen. Anyone familiar with this blog knows that I am not big on battle field books. My interest is really on home front stories, yet I was pleasantly surprised when I read The Right Fight. 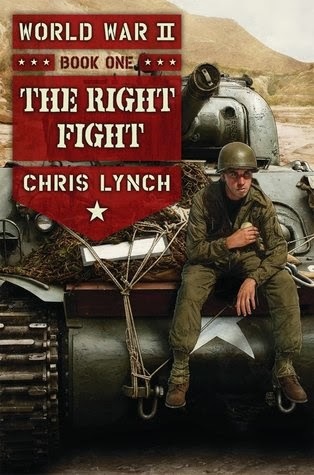 Chris Lynch really knows his way around the front lines and gives us a novel and a hero that will hold you captivated. Roman goes to war with the same kind of ideologically naive patriotism and impatience to get to the front that causes many young men to enlist. Yet, once he is part of the fighting, once reality hits him square in the eye, life changes. Amid death and destruction, a heroic Roman emerges, heroic not so much because of his talented tank driving and loyalty to his tank mates, but because of his dawning realization that even though war is a dangerous, ugly business, he is determined to see it through and get home to his beloved Hannah and the kind of life he is defending. I am actually looking forward to reading Lynch's next WWII book, and I think I will chose one of his books about Vietnam for my War Through the Generations reading challenge. And that is a great endorsement from someone who, as I said before, does not really like these kinds of books. You have made me curious about this book because you don't normally like this type of book, but you enjoyed this one. That makes me want to read it right there! I will have to check these out. I am sure I have students who would enjoy this one. No, I don't usually like these types of books, but I liked Roman's introspection and the way he took in everything and thought about it. It wasn't just a "shoot and kill the enemy" book.